This is the HL, note electrically operated passenger seat and leather trim. 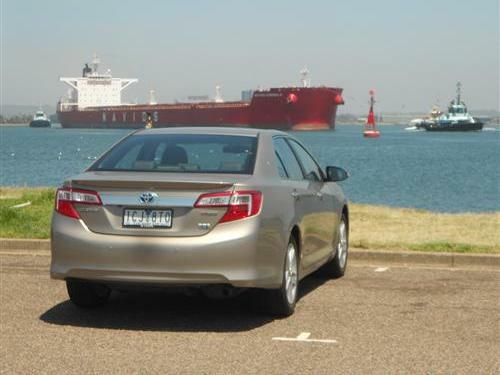 Our drive car for this project was a Toyota Camry Hybrid HL - the higher spec Camry Hybrid. The test car was delivered in Magnetic Bronze, an optional metallic colour. The hybrid version of the Toyota Camry comes along in two guises, a standard version the upper spec version known as HL. Camry Hybrid is priced* from $35,490* and Camry Hybrid HL is priced* from $41,490*. Metallic paint is optional at extra cost. 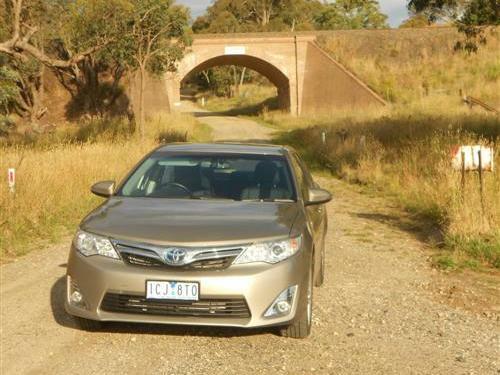 A major component of our drive time with the Camry Hybrid was a long distance road trip. Our travels would take us from Melbourne to Newcastle and return. On top of that we would undertake many driving tasks in and around Melbourne. The road trip to Newcastle included an overnight stay in Albury (NSW), same for the southbound return trip. The long flat stretches of the Hume Highway in Victoria may be considered boring by many people but by the time you enjoy some music and stop a couple of times for a cuppa the hours soon disappear. With the cruise control set on the speed limit, the Camry Hybrid chews up the kilometres with ease. 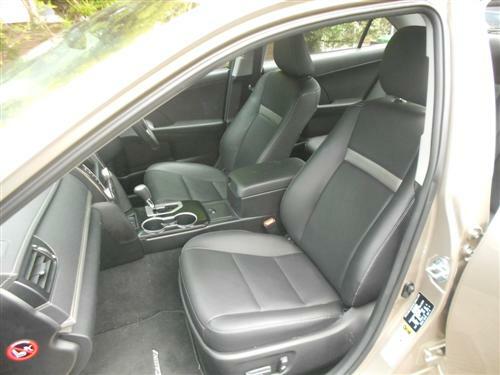 The pleasant leather accented interior makes the journey comfortable. With the essential cup holders well positioned in the Camry it seems nothing could effect the relaxing atmosphere for this extended road test! 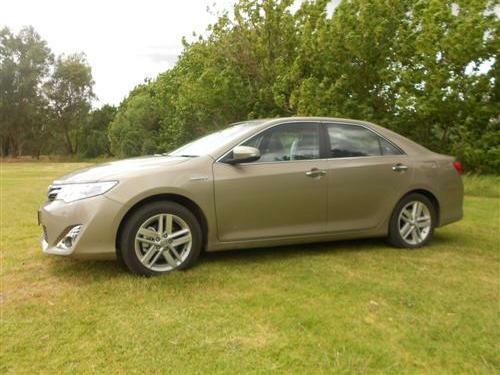 The Camry Hybrid has good power delivery and a satisfying feel about its road manners. Basically, every kilometre becomes more rewarding than the last as you appreciate the presentation of the Camry Hybrid HL and its many qualities. The spaciousness, the comfort, the intuitive controls and the standard equipment make for a vehicle that is relevant for today's motoring requirements. Whilst some hybrid cars have a showy and complex 'space-age' presentation it is pleasing to experience the 'down-to-earth' Camry Hybrid with all controls exactly as they would be with a conventional car. 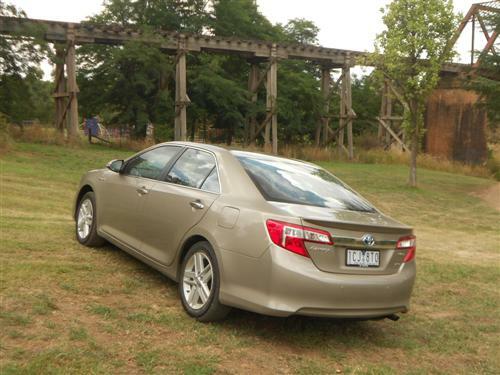 Therein lies the answer, the Camry Hybrid is close to being a conventional car - that's how good it is! JBL premium audio with 7" screen display, Digital Radio (DAB+), 10 x speakers, Satellite Navigation, SUNA™ Traffic Channel and 3.5mm AUX + USB input with iPod® connectivity, Hands-free Bluetooth® with media streaming is included with the Camry Hybrid HL (for compatible devices where service is available). All worked well for me during the extended road test. Although the steering wheel audio control fittings are a little rough around the edges. Camry Hybrid comes with two motors, hence the hybrid. There is a conventional 2.5-litre 4-cylinder engine (Atkinson cycle) and an electric motor. Transmission is a CVT and the Camry Hybrid is front-wheel drive. Electric power steering is standard as is four-wheel disc brakes. Brake regeneration is a feature of the Hybrid models. The parking brake is managed with a foot-operated pedal. Seventeen-inch alloys are standard (including the spare wheel). Factory testing indicates that the fuel consumption rating is 5.2 litres per 100 kms on the combined cycle. This is an excellent figure for a mid-size car that is a larger type of mid-size car. Our average consumption was 6.3 litres per 100 kms according to the onboard trip computer. We were happy with that because we weren't even trying to be economical, we just wanted to drive. Covering a little over 3,700 kilometres in a variety of situations we were quite impressed with our consumption figure. This low fuel consumption makes the Camry Hybrid well worthy of consideration on that fact alone. The fuel tank capacity is 65 litres. Standard petrol (91RON) is suitable for the Camry Hybrid. Camry Hybrid comes with the maximum 5-star ANCAP crash worthiness rating. Plus there are seven airbags, blind spot monitoring (an excellent feature), reversing camera (another excellent feature), Anti-lock Braking System (ABS) with Electronic Brake-force Distribution (EBD) and Brake Assist (BA), Vehicle Stability Control (VSC) and Traction Control (TRC), Hill-start Assist Control (HAC) amongst other features. Kerb weight: 1,610 kg (approx). Capped price servicing is available through Toyota dealers. Once again, conditions apply. The battery for the electric motor never needs charging from an external source. It is recharged as you drive. The battery has an 8-year guarantee. As a keen motorist, I enjoy the occasion side trip. OK, correction - I enjoy frequent side trips! On this particular journey whilst southbound I ventured off the Hume Highway at the wind farm south of Goulburn (NSW). It wasn't long and I came across the old Hume Highway so I decided that I would follow it to Gunning (NSW), a town that I was quite familiar with. But, again, before too long, I came across "Old Sydney Road". This I believed would be the old, old Hume Highway - a well maintained but unsealed road that was particularly inviting. Eventually this road returned to the former Hume Highway at Cullerin just after passing through a tunnel for the main Sydney-Melbourne railway line. Old Sydney Road is a good road but it is narrow and has some low branches so it is unsuitable for long and/or tall caravans, motor homes, vans, trucks and vehicles with luggage on the roof. The little side trip is well worthy of implementation should you have an interest in experiencing old roads. Southbound motorists will come into the historic town of Gunning which features many old charms. Rejoining the Hume Highway is easy when you're in Gunning. 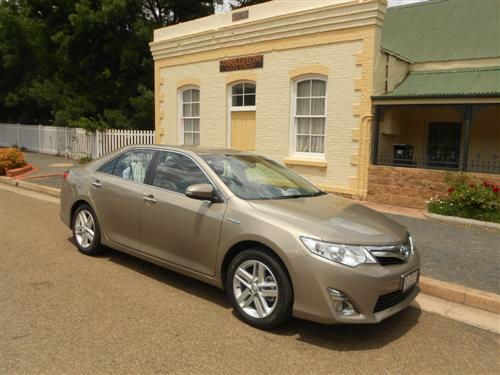 The Toyota Camry Hybrid HL is suitably equipped for motoring enjoyment. Its spacious interior and comfortable ride qualities make it a viable proposition for those wanting more than just a car. The fuel economy makes it a compelling proposition! After a road trip and lots more driving, the Camry Hybrid impressed me greatly! It is a very pleasing and an uncomplicated set of wheels. Little wonder that Camry is making a difference with hybrid opinions! Although this long distance drive project is complete, let me say that I will do a road trip in a Camry Hybrid anytime!